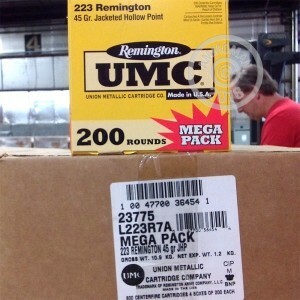 If you have a "mega" vermin problem, you need this "mega pack" of .223 Remington ammunition to keep it under control. These cartridges from Remington's UMC division fire a light 45 grain jacketed hollow point bullet at an impressive muzzle velocity of 3,550 feet per second and deliver devastating fragmentation on impact. This ammunition is designed to kill pests via both expansion and fragmentation, so don't use it on anything you intend to eat! AmmoMan.com can help you acquire your shooting supplies without paying an arm and leg for shipping. Simply place an order for $99 or more and receive free delivery regardless of package weight!